Welcome to Week Two, and two new stitches! Kate Eastwood’s gorgeous Spring Sampler Shawl can be made in any DK yarn, and is a great way to learn new techniques! Join in with us! Many of you have completed the first two bands of the Spring Sampler Shawl, so we are now ready to crack on with Part 2! (If you have missed part one, you can find it here!) It’s been wonderful to see the photos of your progress being shared and all the lovely different colourways emerging. For this part of the CAL we will be working a further two stitch bands and two more dividing strips: the first band is worked in Zig Zag stitch and the second is worked in Waffle stitch. Once you’ve completed these, you will then be able to finish the second half of the shawl as the last three stitch bands are repeats of band 1 in Suzette Stitch, band 2 in Alternate Bobble Stitch and band 3 in Zig Zag Stitch. Just before we get started this week – hands up anyone who has counted to 300 sooo many times and then lost count just as you get to the end of the row? Well, I can’t tell you how many times this happened to me before it occurred to me to use stitch markers as number markers! I also want to add at this point that with it being such a long row it’s all too easy to get to the end of the row and find that one stitch has gone awry or an extra one has sneaked its way in. With this in mind I found a good time to check the number of stitches was at each dividing band. If you find at this point that your count is slightly out a stitch can easily be either adding by increasing (working 2 stitches into one stitch) or taken away by decreasing (working 2 stitches together). Row 1: Working in to the back loops only, work a row of DC (SC US). 300 sts. Finish off. Work a total of 10 rows of Zig Zag stitch. Now work a final row of DC (SC US). Check that your stitch count is correct at this point and if need be increase/decrease as necessary. 300 sts. Finish off. Repeat Rows 2 and 3 four times. Work a row of DC (SC US). 300sts. Finish off. At the end of this part of the CAL your work will be looking like the picture below, and you have now reached the middle band of the shawl. The next stage is to repeat three of the stitch bands that you have already worked, starting with a band of Zig Zag Stitch, followed by another band of Alternate Bobble Stitch and finishing with a band of Suzette Stitch. Next week will be the final part of the CAL where we will be finishing off your shawl with a border: there will be full details for three different types of edging: a light ruffle, a plainer straight edge, and a straight edge with a bobble border along the two ends. Merion, Kate, Pauline and Louise will be joining you in our LoveCrochet CALs Facebook group to answer your questions, and you’ll be able to ask us about the shawl techniques and construction – and of course show us your progress! To join the group, click here! Show us your progress on Instagram! We’d love to see your pictures on Instagram! Use the hashtags #crochetcrew and #pickyourpalette to show us your progress! Spring Sampler Shawl CAL Part One! Introducing the Spring Sampler Shawl CAL! 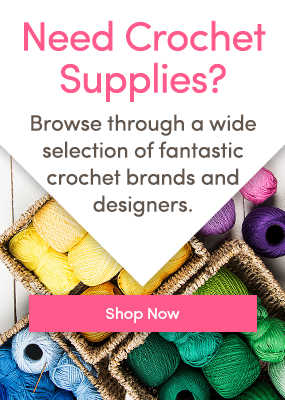 The Learn to Crochet Project: Week Three! The Learn to Crochet Project: Week Two! 5 Responses to Spring Sampler Shawl CAL Week Two! Can i just ask on the zig zag stitch row 3, you say work a row of Zig Zag stitch as in Row 1. However row 1 is a DC row. I think I’m having a senior moment!!!! You are quite right! It’s not a senior moment at all! I’ve corrected it – it should say Row 2! Has week 3 been posted yet? I can see week 1 and 2, but not week 3. Thanks! Not yet! Week 3 will be posted on the 15th March!